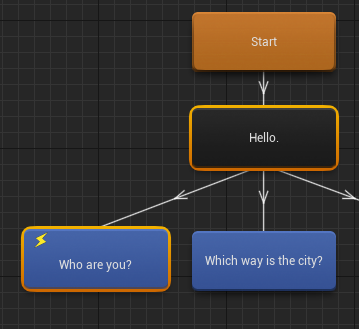 Can you add a node that will close the dialogue? Sorry, don't understand exactly how you want to use sounds in conjunction with conditions. There's no PlayPlayerReply event in the 4.19 version yet, and it's a bit more complicated than just adding the stuff from this screenshot, because you also need to be able to skip the audio and the delay if you hit "continue" before it plays out, but it's a start if you want to try implementing it yourself. Otherwise, it'll be out in 4.20. That sounds right, but I think I mean opposite from what you said? I just want to make sure I'm not mixing it up. The example we are trying to do is the NPC is playing a dialog audio in their node, and we don't want the player choices for the response to appear until the audio is finished playing. Thanks for the screenshot, that is super helpful to helps us think about it until the update. It sounds like the update is doing what we are wanting to do and are looking forward to it. Call "Remove From Parent" on the dialogue widget. we don't want the player choices for the response to appear until the audio is finished playing. I recorded a short vid to answer that question. I didn't even think of checking for a float variable related to the audio duration. Thank you so much for the short video reply. I want to fire custom event in player controller thru dialog option, but i don't get even a print string out. I am new to blueprints so I guess it's something silly... What iam doing wrong? 1. Does it work if you put it on an NPC node? 2. If not, could you post a screenshot of how you spawn the dialogue widget? Might be a problem there. Hello there, I'm trying to use this plugin for an RPG that I'm making and I'm wondering about multiple dialogue's for the same person. To be more precise, have an NPC who has one dialogue at the start, and then has a different dialogue after a certain event (like finishing quest). My first thought was to create a single dialogue file that has multiple start points and then have an event that just changes which start point to pull from. So first off, is that possible? And if not, what would you suggest? You can either keep all your dialogue trees in a single dialogue file, or you can change the NPC's dialogue reference through an event once the quest has been completed. The first scenario requires you to keep a variable on your player that you'd save in a savegame. The second scenario requires you to save the state of your level in a savegame, and then restore it, so your NPC would always reference the correct dialogue file. I think the first one is easier and is more versatile. The two approaches can also be combined, if required. I'm sending a new version to the marketplace today, should be up in about a week. I've made some changes to the default UMG widget. 1. Added a node PlayDialogueSound, which makes sure that you never play 2 sounds concurrently (by interrupting old sounds). Also added StopDialogueSound node, in case you want to call it when you quit the dialogue, for example. 3. Moving the mouse away from a line keeps it selected. 4. Clicking on a selected line is now also possible through gamepad's bottom face button (even if you selected it through mouse hover). So a player can switch between keyboard and gamepad at any time. 5. Selecting a dialogue line is possible through mouse hovering as before, but now also by using gamepad (up/down on the d-pad). The widget is now more gamepad friendly out of the box. 6. If a sound is playing from a player voiced line, displaying next NPC lines is delayed until your player finishes saying his line, but you have a "continue" button to skip the delay. 7. I may have fixed a bug where player nodes didn't fire events (not sure if this was done in this version or before that). 8. Added a few instructions to the documentation regarding how to override demo widgets. In short, these are general improvements that should be useful for most people, but most importantly they're optional. - E.g. if your player lines are never voiced, you shouldn't worry about the #6. - If your game doesn't support gamepad, you don't have to worry about #4 and #5. - If you don't want to have a currently selected line (#3), simply disconnect the HighlightSelectedReply method from its body. Last edited by CodeSpartan; 07-21-2018, 02:41 AM. Resubmitting again today, because I added some more things. - Added Copy, Cut, Duplicate and Paste functionality (hotkeys use editor's standard bindings). 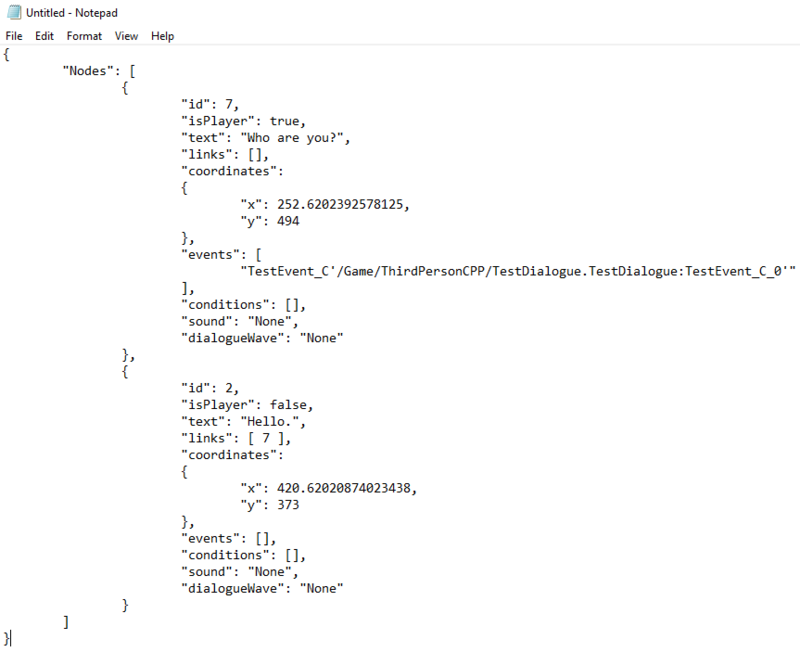 - Copying nodes produces Json, so it's possible to paste nodes to notepad, to other dialogue viewports or to send the output to other team members through instant messaging. Update: I haven't figured out how to correctly serialize/deserialize conditions/events yet, so when you paste nodes, their conditions/events will be empty for now. Last edited by CodeSpartan; 07-25-2018, 05:48 AM. The update has been processed by the marketplace team. I downloaded to test it and noticed two problems. 1) when you launch your project, you may get a warning about DemoDialogueWidget referencing an unexisting asset. It's a fake warning, because it doesn't actually reference it in any way. I'll fix it in the next update. Or you can just fix it yourself by doing "Refresh Nodes", then hit Compile & Save. 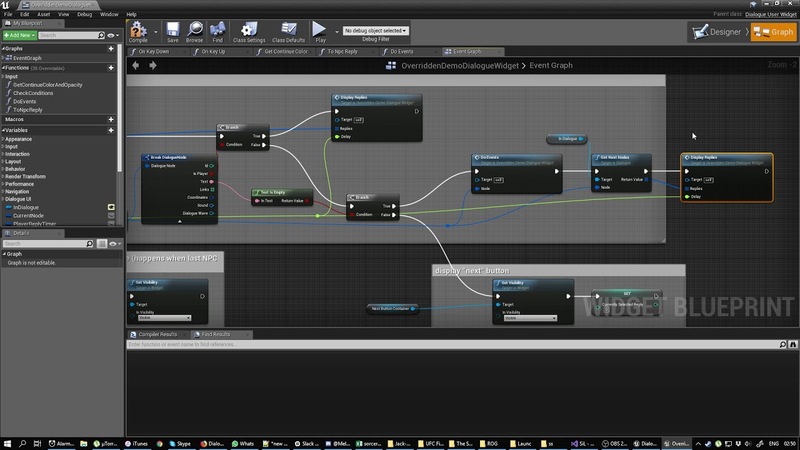 2) Trying to copy nodes that have events/conditions that reference assets - will crash the editor. It's some old code that I forgot to remove. I've submitted a fix. Hopefully it'll get processed soon. Last edited by CodeSpartan; 07-25-2018, 02:33 PM. Fixed version is now live. I love this plugin, great job CodeSpartan. Does anyone have a quest plugin/system that would work well with this on MAC as well? Unfortunately the solution I was planning on using (https://www.unrealengine.com/marketp...uest-extension) does not work on MAC. I've been working with that author for a while to try to get it up and running but for some odd reason, the stubborn thing will not show up on a MAC. Last edited by EmpireLion; 07-26-2018, 07:43 PM. You could use this plugin as convenient base for quest system. Most of this code (and the most useful one) is the generic node editor. It's super easy to remove dialogue data and logic. - Data for this editor is defined as UDataAsset, simply addd your properties in C++. - Add your custom logic for quest system in C++ or blueprints. Yes, writing it on your own still does requires C++ skills. There's no need for a quest system to be node based. I considered making a quest system at some point, even put its general architecture on paper, and it wasn't going to be node based. In RPGs such as Pillars of Eternity it's not node based either. It's just my opinion, of course (except about PoE, which is a fact). Last edited by CodeSpartan; 07-27-2018, 09:35 AM.